Phone call:Support GSM/GPRS on 850/900/1800/1900 mHZ network globally,require Micro SIM card from local mobile carrier. Step 1:Switch on Bluetooth both on Smartphone and Watch, Choose “Bluetooth” app to switch on/off the Bluetooth by clicking “Power” . Step 2: Open the “BT dialer” APP, search new device,click on the target device to request pair, just lick “Pair” on the phone to confirm. Step 2: customize BTNOTIFICATION for apps message push on smartphone. 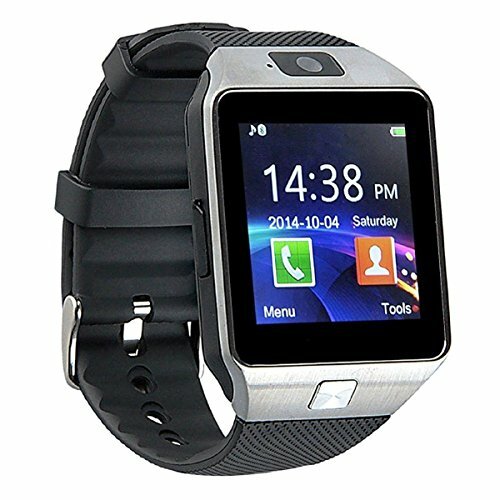 GSM MOBILE PHONE -Phone call & SMS from the watch directly,GSM phone working in 2G GSM 850/900/1800/1900MHz network in global,GPRS for internet surfing.Need customer buy Micro SIM card from local mobile carrier. EXCELLENT BUY FOR THE MONEY Can’t beat this for the money. Someday I’d like one that is less bulky on my small wrist, but I can live with the size for under $30! I read some reviews that said it’s difficult to type out a message – I didn’t find that to be true at all. I also saw a review that said it didn’t pair well; I have had no such problem. The only “problem” I have with this smart watch is holding my arm in position when on an unexpectedly long phone call – really can’t blame the watch for that!